The reopening of Marta Abreu railway terminal, after full repair, was one of the investments undergone by Centro Railway Company during the first half of this year. From January to June they worked in the railway stations of the municipalities of Ranchuelo and Remedios, both in Villa Clara province, and the perimeter fence of Cienfuegos maritime terminal, actions that will conclude in the third quarter of 2017. Ernesto Simonó, director of investments of the company, told ACN that they are working in the Santa Clara Containers Loading and Unloading Center for the installation of equipment that increases the operation capacity. He noted they are making changes in carpentry and painting the Placetas and Cascajal stations, in addition to build rail access to the future station of Candelaria, in Cienfuegos province. 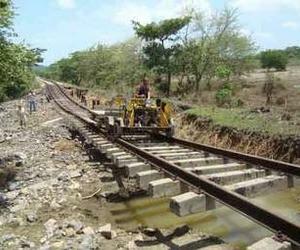 Milagros Arenas, director of Rail Transportation Administration, reported that a 31-meter steel bridge is being repaired, and another two are scheduled to be executed this year, all in the province of Sancti Spiritus.